Focaccia bread is one of the great additions to all kinds of meals or it can be perfect for you to use for sandwiches of all kinds. There are lots of different ways you can make it, from having a plain and simple bread to one loaded with all kinds of toppings. There are lots of different things I would like to try on focaccia but I was looking for something pretty simple to start with for my first time out giving this type of bread a try. 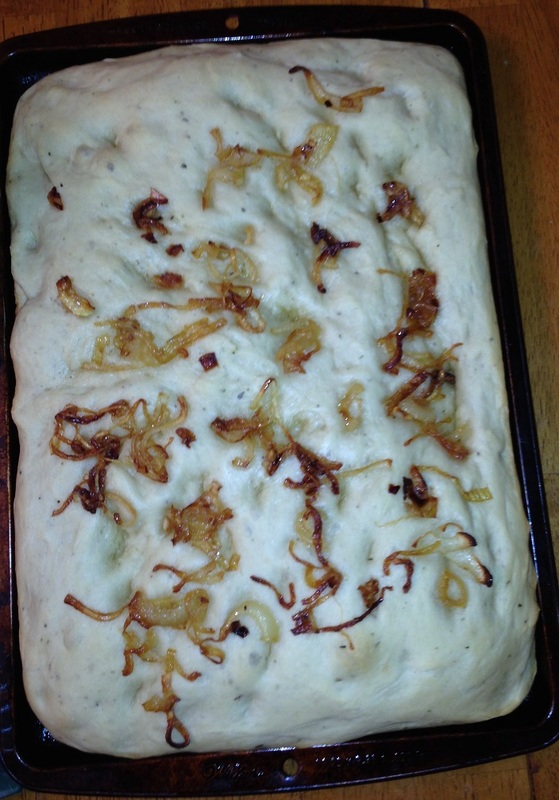 I found this recipe on Williams-Sonoma’s website and the original recipe calls for a bacon, Gruyère and caramelized onion focaccia, so I decided just to go with the caramelized onions as a topping as I thought it would be a nice side for the pork dinner I was making that night anyway. It gave me a good starting recipe that if I liked I could use again as the basis for one with other toppings. In the bowl of a stand mixer, dissolve the yeast and 1 teaspoon of the brown sugar in the warm water. Let the mixture stand until it is foamy, about 10 minutes. Add the flour, 4 tablespoons of the olive oil and the salt. Attach the dough hook to the stand mixer and knead on medium-low speed until the dough is smooth and elastic, about 10 minutes. Form the dough into a ball, put it back into the bowl, and cover the bowl with plastic wrap. Let the dough rise in a warm, draft-free spot until it doubles in size, about 1 hour. Meanwhile, in a large cast-iron frying pan add 1 tablespoon of butter and melt it over medium heat. Add the onions and saute over medium-low heat until they start to wilt, about 3 minutes. Stir in the remaining 1 teaspoon of the brown sugar and a pinch of salt and continue to cook until the onions are golden brown and caramelized, about 20 minutes. Remove the onions from the heat and allow them to cool. Oil a rimmed baking sheet with the remaining 2 tablespoons of olive oil. Dump the dough onto the prepared pan and press it into a rough rectangle. Using your fingers, stretch the dough into a rectangle about 10 by 14 inches Cover the dough loosely with a kitchen towel and let it rise in a warm, draft-free place until it is puffy, about 1 hour. Position a rack in the middle of the oven and preheat the oven to 425 degrees. Dimple the surface of the dough with your fingertips. Gently brush the dough with olive oil, then sprinkle the dough evenly with the onion mixture. Bake until the bread is golden, about 15 to 18 minutes. Cut the focaccia into squares and serve them while warm. This bread is perfect as a side dish for any meal, or as an appetizer before the meal. If you want to add the cheese and bacon, add the Gruyère into mixture when you add the olive oil and salt when you are making the dough. The bacon can be added when you are sauteing the onions and added as a topping. You could certainly add some extra cheese as a topping as well if you wanted. I thought it was perfect with just the onions this time and it was great to use the squares for sandwiches later on for lunches.